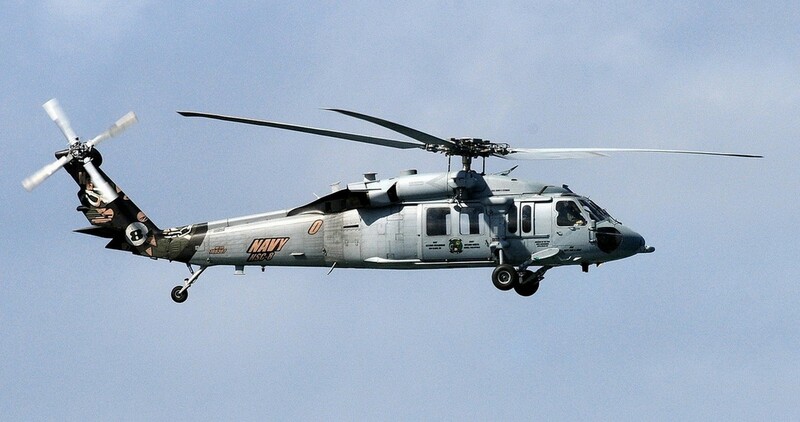 Everyone in San Diego County, and probably most people in Southern California, are use to seeing U.S. Navy helicopters flying back and forth across the skies. But every now and then, you spot one that looks just a little different. It’s not just that typical Navy gray in color, but the occasional one has a very visible and colorful painted tail. 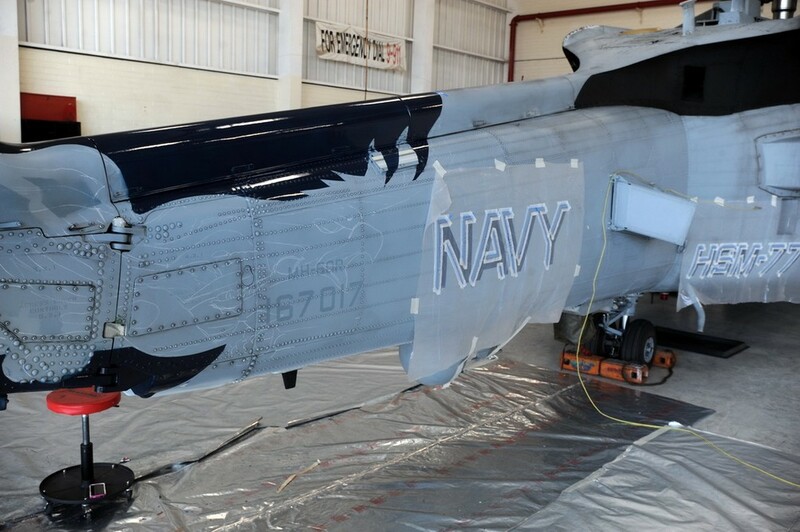 For several years, the tradition seemed to have been waning away, and there has been plenty of discussion on the aviation Internet forums as to whether the new generation of fighters will ever have tail art as in the past. 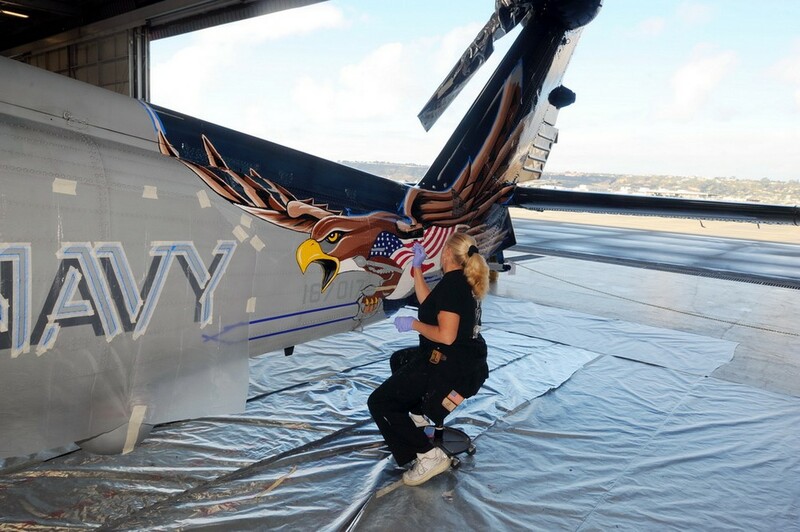 I, among others have always assumed that the tail art that we do see, is done by the military themselves, and then I found out about Master Sergeant Shayne Meder USAF Ret. (a.k.a. 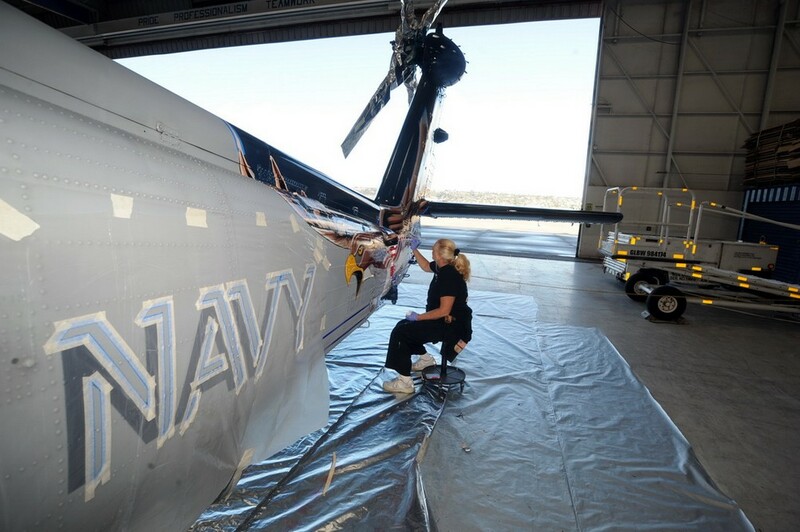 Flygirl Painter). 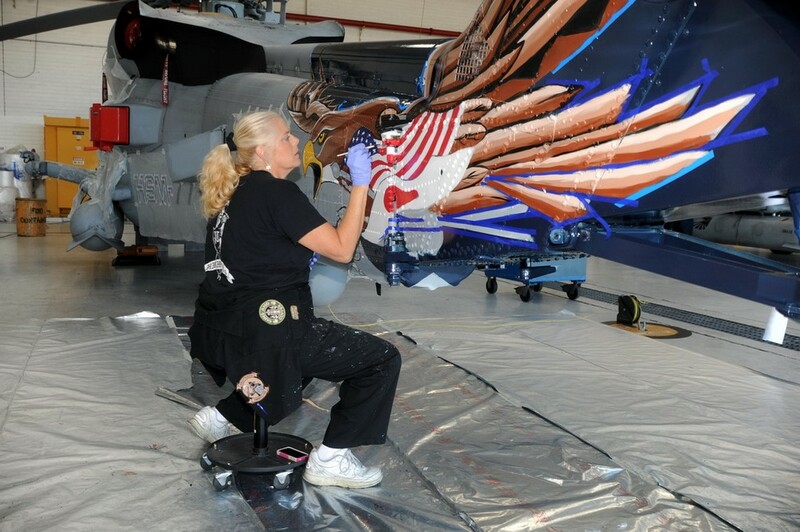 Meder served for 20 years in the United States Air Force, and once out of the USAF, she went to work at the March Air Field Museum, near Riverside, CA., where she did maintenance and restoration, and then later she was hired to work at the Wings and Rotors Air Museum at the French Valley Airport in Murrieta, CA., doing aircraft maintenance and marketing for the Museum. 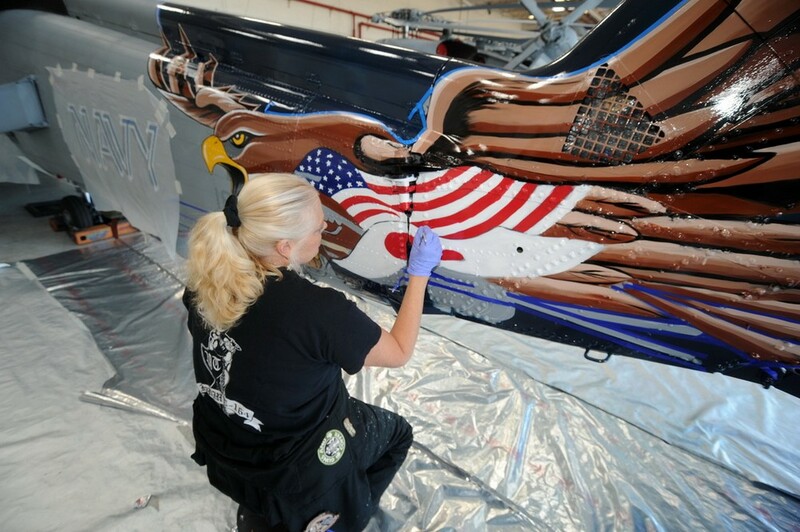 She has helped restore and painted all types of planes from B-17’s and B-52’s to F-4’s. 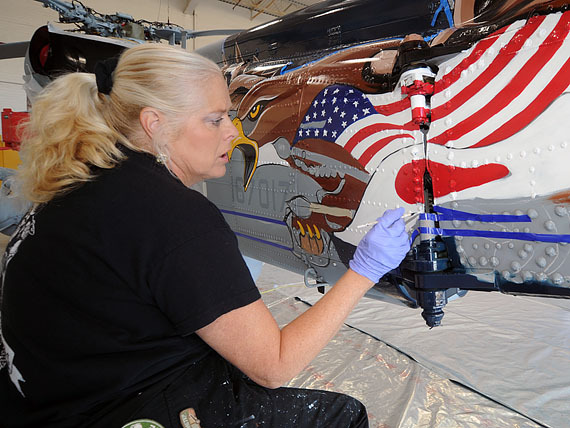 As “Flygirl Painter” (as she has become to be known), she volunteers her time and skills, along with her husband, Scott Donnell, who does a lot of the prep and layout work, to paint the different helicopters of the local U.S. Navy and Marine Corps squadrons that have requested her. That’s right; she volunteers to do the work. 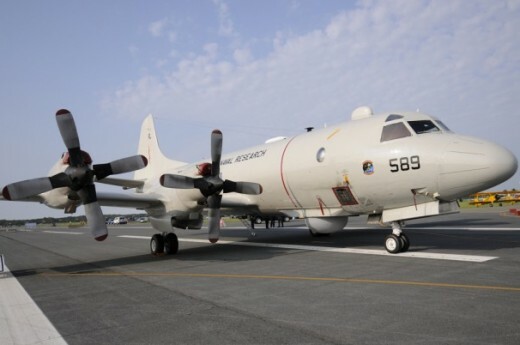 The various squadrons will supply the polyurethane paints, and if Meder has to travel, being retired military, she stays on base. Meder says she does this “for love of the military, and giving back what the military gave her”. 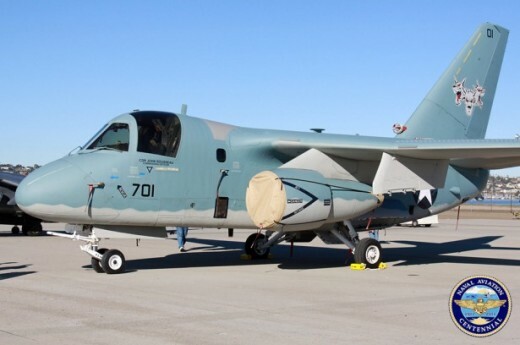 When asked if she would do civilian planes?, she quickly said “No way, they are boring! 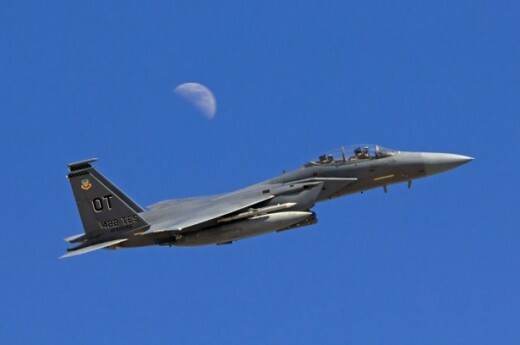 And laughed”, She is all military. 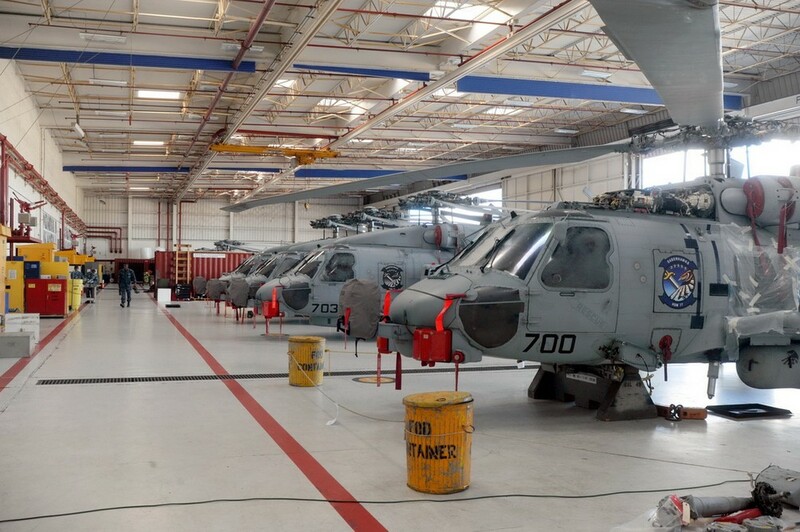 Meder also states that if it weren’t for her employer, Pat Rodgers, “Pat, supports the work I do, and allows me the non-paid time off to complete these projects, as he understand my passion for the military” Mr. Rodgers is the Director of the Wings and Rotors Air Museum. 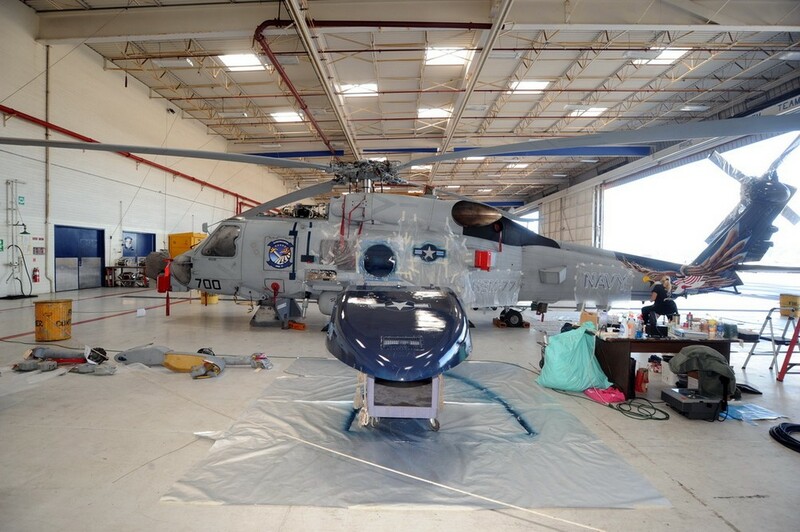 The helicopters that get painted are usually the Commanding Officer’s helicopter, or the CAG’s (Commander Air Group), but any of the squadron’s pilots can, and will fly the painted helicopter. 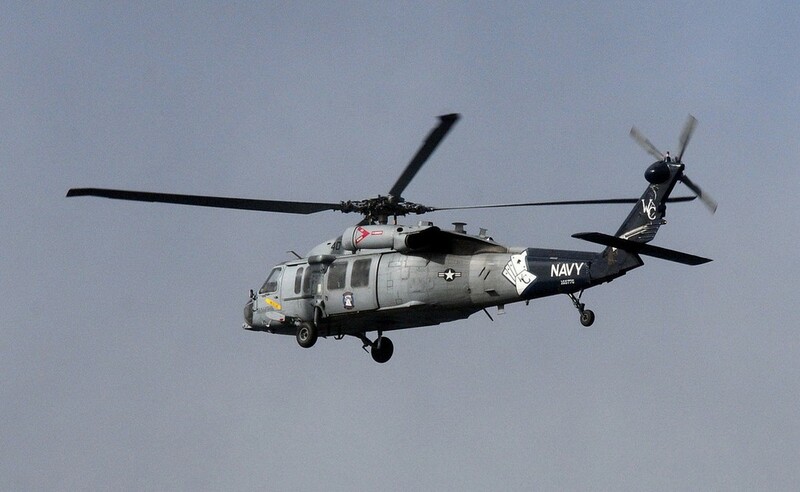 These helicopters are also used in Air Show’s and other promotional events. 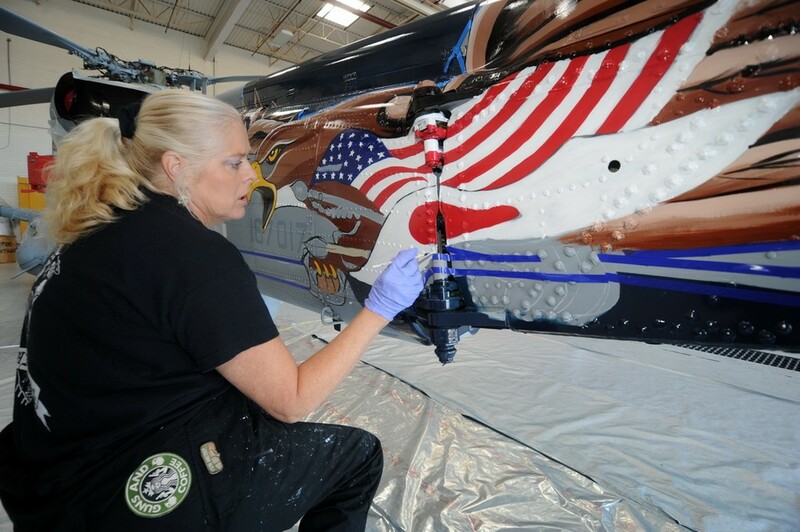 Meder started painting Navy Helicopters in 1999, and 2012 has been her busiest year. 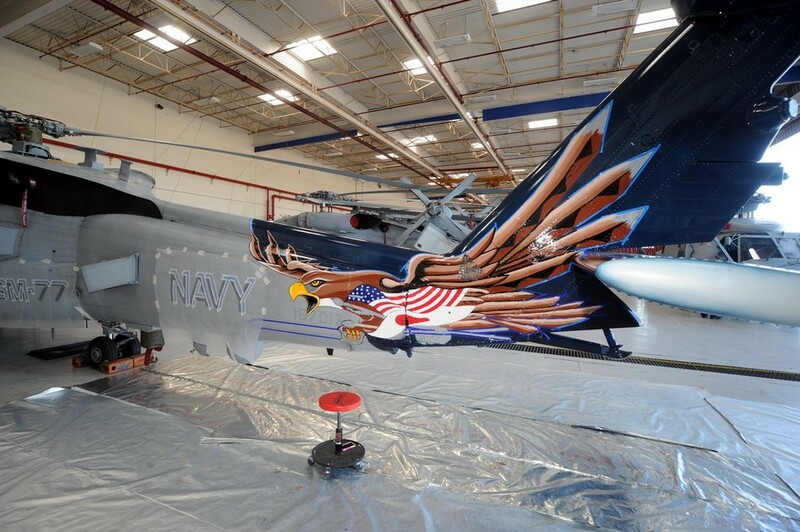 As we’re chatting about her current project, another squadron, HSM-75 The Wolfpack, had already approached her, and asked for her to paint yet another helicopter for them, as the one she had painted before, for the squadron had just been damaged in a hard landing. 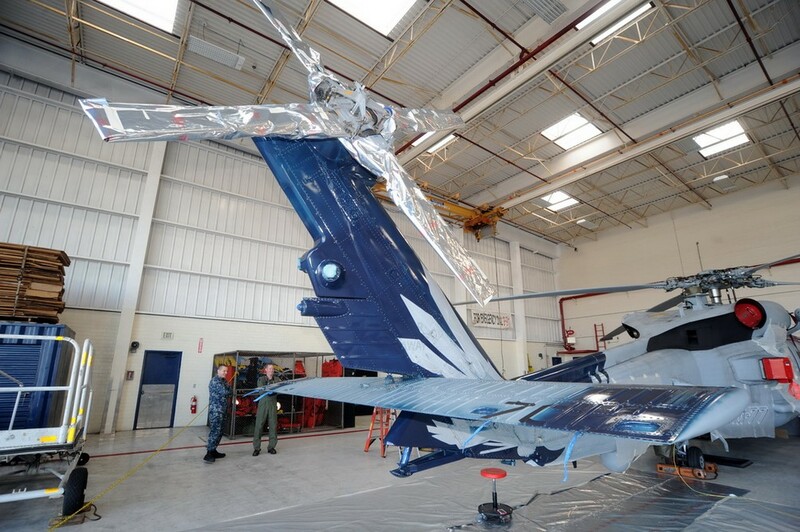 Meder states that it usually takes about a week to do each helicopter, so this is a time consuming passion as she is on her 12th project this year. 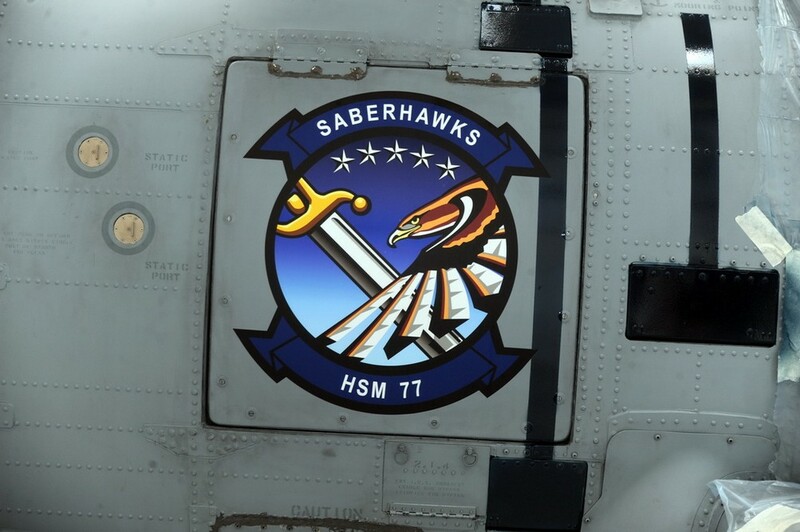 The project, that Meder is currently working on is for U.S. Navy Squadron HSM-77, the “Sabrehawks”, commanded by Commander Brent C. Guat. 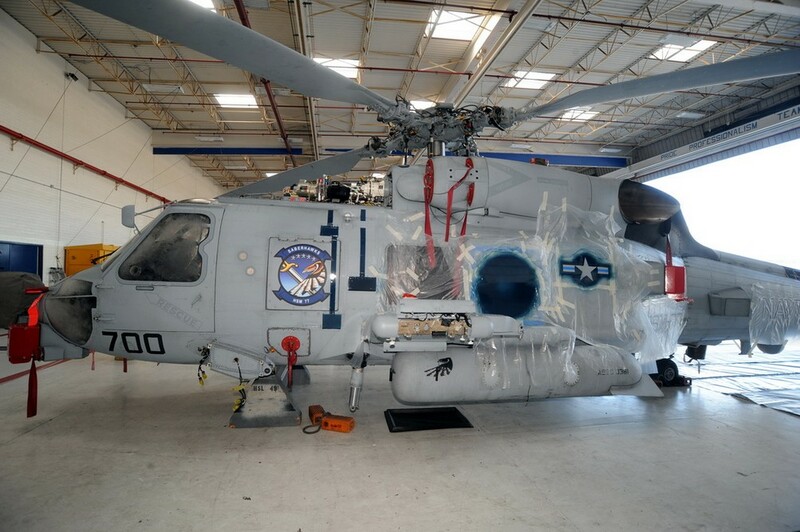 HSM-77 is an Anti-Ship/ Anti-Submarine squadron, currently based at Naval Air Station North Island, but will be transferring in 2013 to Naval Air Facility Atsugi, Japan. 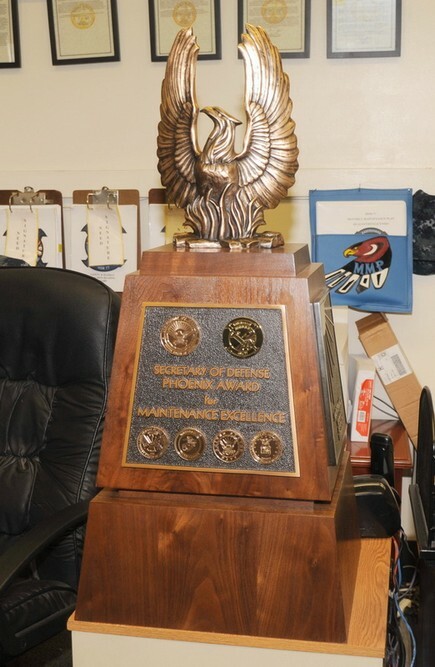 The Squadron won the coveted Secretary of Defense’s Maintenance Award for 2012, and is the 1st Naval Squadron in the history of the award to do so. 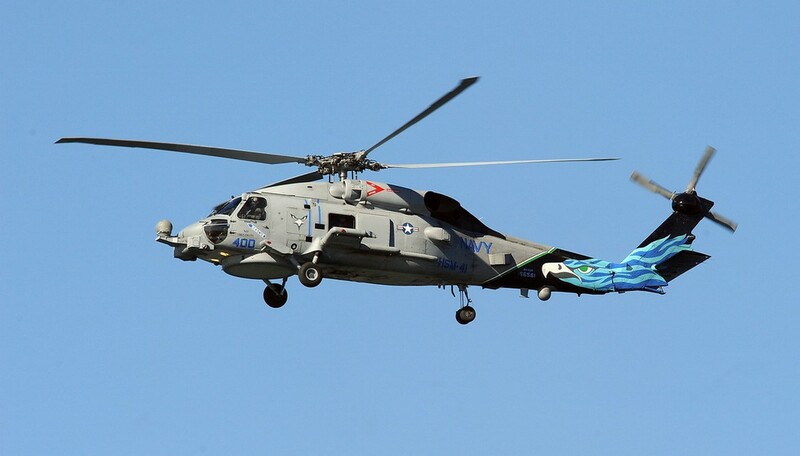 This is a great honor and Meder will also make sure that the award’s logo will be on the helicopter as well. 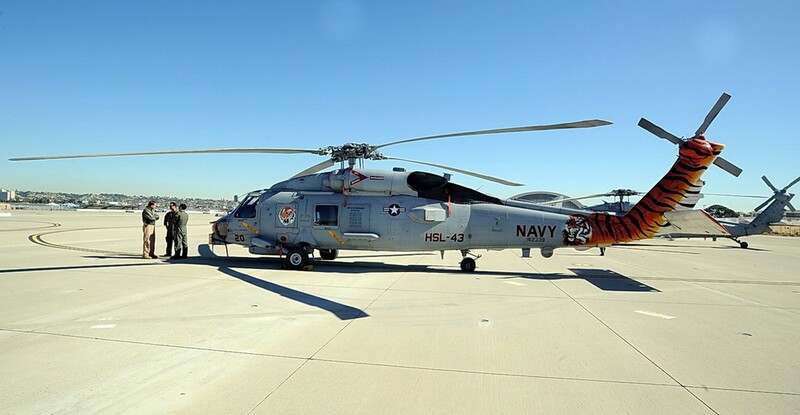 I want to thank not only MSgt Meder for taking time out of her precious volunteer time for this interview, but also the United States Navy, CMDR Brent Guat, and Lt. JG Adam Arndt of HSM-77 for access to their squadron and helicopters, and to Lt. Kagle and CPO Raile of the US Naval Air Forces, West Coast Public Affairs Office for coordinating my visit to NAS North Island.